Review: Creed: Rise to Glory One of the best boxing titles in VR. The post Creed: Rise To Glory Review – Unleashing The Eye Of The Tiger appeared first on UploadVR. Survios’ Creed: Rise to Glory finally steps into the ring today, though it’s missing a key feature on Sony’s PlayStation VR (PSVR) headset. Last week we reported that the VR boxing game was getting an online player vs player mode, allowing friends or strangers to punch each other in the face. At the time, Survios confirmed that the game would support cross-play, meaning people wearing different types of VR headsets could still play together. Following the news, Survios confirmed to UploadVR that this feature would work between the Oculus Rift and HTC Vive but not PSVR. PSVR players will get a sort of trade-off in the form of an exclusive character – Young Rocky. In the main game the older version of the boxing legend will help train you, but you’ll only be able to fight him in the console version. It’s a shame, as cross-play is a great way to help flesh out online communities for VR games, and Rift and Vive owners would no doubt benefit from having PSVR fans join them. Games like EVE: Valkyrie and Rec Room, for example, do support cross-play across all three headsets. Still, given that we were looking forward to Creed even before we knew the online mode existed it hasn’t shaken our confidence in the game too much; we still think it’s going to be a contender. Creed: Rise to Glory hits Rift, Vive and PSVR on September 25th. The post Creed: Rise To Glory Won’t Support Cross-Play On PSVR appeared first on UploadVR. The Walking Dead: Our World Reveals Revenue Success The Walking Dead: Our World AR mobile title amasses $8 million in revenue after less than two months. Duke Nukem’s biggest rival, Serious Sam, has embraced VR with open, overly-muscular arms, but where is Duke’s own VR game? With a little help from a fan and Sam himself, it’s getting there. Serious Duke 3D is a partial remake of Duke Nukem 3D with full VR support. Created by Syndroid, it’s essentially a mod of Serious Sam 3 using Croteam’s Serious Sam Fusion platform (which you’ll need to own in order to play). That means there’s full support for motion controllers and, as a video recently shared by Syndroid shows, even a pretty good approximation of Duke’s full avatar in VR. Sounds and other assets have been taken from the original game to provide an authentic experience. This being a Serious Sam mod, you can also play the levels in co-op, although Syndroid does advise to keep it to a maximum of four players considering the game was initially designed as a single-player experience. Right now the mod has the game’s first three levels ready to play and the developer aims to add two more, rounding out the L.A. Meltdown episode. Syndroid doesn’t yet know if a remake of the first level of the game’s second episode is on the cards, too. It’s about as close to Duke in VR as we’re ever likely to get after the disastrous release of 2011’s Duke Nukem Forever. This isn’t the first shooter from this era of gaming that’s getting the VR treatment. We recently reported that another modder has just released a VR version of Wolfenstein 3D, and you can play Doom and Heretic in headsets, too. What’s old is new again, I guess. The post Duke Nukem 3D Is Getting The VR Treatment Via A Fan-Made Mod appeared first on UploadVR. VR vs. No Cause For A Llama Kevin heads home from EGX 2018 charting all the VR titles there. Neither the list nor the journey will take that long. To Boldly Go… to the Toilet in VR Flush Humorous VR titles makes its way onto HTC Vive, Oculus Rift and Windows Mixed Reality. Mysterious Unknown Pokémon Appears In Pokémon Go Is it a glitch or a promotion? Speculation runs wild as a strange new Pokémon appears in Pokémon Go. Community Download: What Do You Expect From Oculus Connect 5? Alright folks, it’s finally (almost) time for Oculus Connect 5! Later this week on September 26th and 27th down in sunny San Jose, CA, the big wigs at Facebook and Oculus will descend on the convention center, along with hundreds of developers, VR enthusiasts, and members of the press to analyze and experience the future of virtual reality. Oculus Connect is always one of the biggest events of the year for the VR community and this year is shaping up to be no different. With the recent release of the Oculus Go standalone headset, continued growth of the Rift platform, and now forthcoming news on an official Santa Cruz-powered consumer headset that’s reportedly slated for Q1 2019, there is a lot of news expected to come out of the show. We have our fingers crossed for lots of Santa Cruz hands-on time, we want to see more of upcoming games like Defector, Stormland, and whatever Respawn Entertainment is working on, and we of course can’t wait to see what surprises are in store. But the question at hand is: What do you expect from Oculus Connect 5 this week? Do you think it will be lots of new content, updates on stuff we know about, or a heavy focus on hardware? Or maybe something completely different? Let us know down in the comments below! And don’t forget to read UploadVR Senior Editor Ian Hamilton’s predictions for OC5 as well. The post Community Download: What Do You Expect From Oculus Connect 5? appeared first on UploadVR. Get your hand wraps and virtual boxing gloves ready because I just heard the bell ring and it’s time to get ready to fight! Creed: Rise To Glory releases tomorrow, September 25th, for PSVR, Rift, and Vive and we’ve got 10 Steam copies ready to hand out, for free, no strings attached. All you have to do is enter into our giveaway right here or down in the widget below. Winners will be randomly selected. All of our keys are Steam keys, which means they will unlock the game with native support for either Rift or Vive. The core of what makes Creed special among VR boxing titles is how it threads the needle between silly, arcade boxing like Knockout League and realism-focused simulation along the lines of Thrill of the Fight…Boxing as a sport is a great fit for VR because of how active it is and how focused it is on hand movement. Since motion controllers (and headsets) do a great job of tracking movement already, it’s a natural fit. The post GIVEAWAY: Win A Free Copy Of Creed: Rise To Glory On Steam For Rift Or Vive appeared first on UploadVR. Alaska Airlines Begins Offering VR Movies on Some Flights Alaska Airlines passengers will soon be able to relax with some VR entertainment with VR headsets from SkyLights. The post China Looks To Better The Treatment Of Wildlife With First ‘VR Zoo’ appeared first on VRScout. Krikey Launches Multiplayer AR Title Krikey AR app launches on Android with new multiplayer Tennis mini-game. In 2014 I sat in the audience at Oculus Connect and listened to Brendan Iribe talk about open sourcing the first development kit for the Oculus Rift as he laid out two paths forward for Facebook in VR. According to Iribe, in the years ahead Facebook would help deliver consumer VR products that were either PC-powered or phone-powered. Four years later, Facebook has completed the journey Iribe outlined in that first keynote. Starting Wednesday at 10 am Pacific I expect Facebook CEO Mark Zuckerberg and the team he’s assembled to present phase two of his plan to deliver a mainstream spatial computing platform. 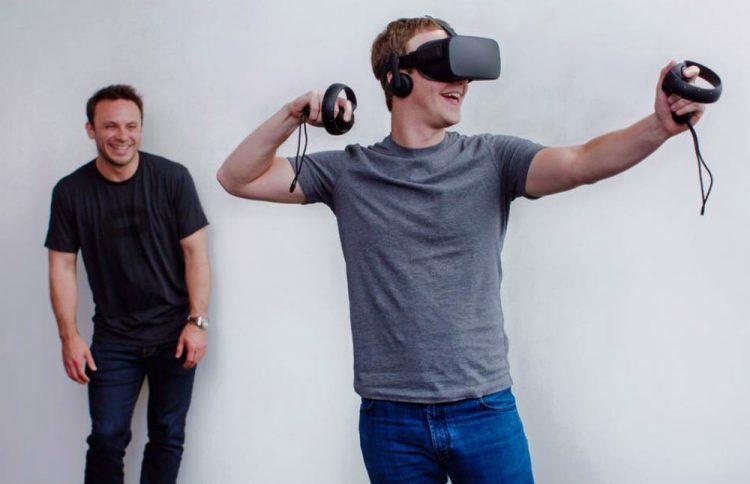 With the pressures Facebook faced just in the last year regarding abuse of its ad platform and business model, and reading between the lines of Zuckerberg’s comments during earnings calls, it seems possible to me (having never spoken to the man behind the curtain) that there is no greater hope for Zuckerberg to save his company right now than Oculus. Oculus is Zuckerberg’s best chance at building a company that is not reliant on advertising as its primary source of revenue. Here’s how Zuckerberg, Hugo Barra and other Facebook leaders are likely to lay that story out at OC5. Going forward, I would argue there are still two paths for Facebook to try and dominate the VR market. 1.) Produce a low cost standalone headset that can play Superhot and Beat Saber just fine. 2.) Keep pushing with PC VR to enhance the feeling of presence while making setup easier and lowering overall cost. This means that I would expect Oculus Connect 5 to see Facebook focus on showing why owning an Oculus Go or Oculus Rift in 2018 is a good idea. That means showing off new and better software, like the second screen viewer for Oculus Go we’ve been asking Oculus CTO John Carmack about for several months. After that, though, is the job of showing why it would be a good idea for developers to become deeply invested in Facebook’s tools long term. That probably means getting rid of the name Santa Cruz, giving Facebook’s 2019 standalone VR headset a permanent name and hinting at what experiences will launch with the hardware. One note — don’t expect Santa Cruz to have VirtualLink. It is a nice idea but I am not expecting Facebook to use it in the first generation standalone. I will be disappointed if Facebook doesn’t show Half Dome to at least journalists at OC5. I think it is likely that Half Dome’s eye-tracking isn’t 100% perfect yet and for that reason it may or may not make an appearance. I sure hope it is good enough to be shown as a feature prototype in a highly controlled setting — the same way I saw Santa Cruz in 2017 and 2016 — but there are also pieces of Half Dome (like its ultrawide field of view) that could be shown as a major step forward for Facebook without the varifocal optics. The post Oculus Connect 5: A Glimpse Of Facebook’s Phase Two appeared first on UploadVR. Pixvana Officially Launches Cloud-Based VR Platform SPIN Studio Users can sign up for a free trial of SPIN Studio today.